"Campbell's® Condensed Cream of Mushroom Soup flavors a creamy sauce that is mixed with tuna, egg noodles and peas, topped with a crunchy bread crumb topping and baked to perfection." Stir soup, milk, peas, tuna and noodles in 3-quart casserole. Bake at 400 degrees F for 30 minutes or until hot. Stir. Mix bread crumbs with butter in bowl and sprinkle over tuna mixture. Bake for 5 minutes more. For a Cheese Topping: In place of buttered breadcrumbs, top with 1/2 cup shredded Cheddar cheese over hot casserole. 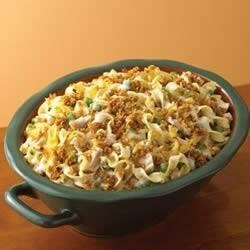 For Chicken Noodle Casserole: Substitute about 2 cups cooked cubed chicken or Swanson® Chunk Chicken, drained, for tuna. Pretty bland so you have to add some seasonings. NOT potato chips, bacon, sausage and all the other garbage people are adding to make it a Fat Tuesday meal. Jeeeeez. Great!! I use 1 can mushroom and one can celery, and season it. I also use potato chips and cheddar on top! Love this recipe!! Wonderful recipe,of course everything made at Campbell's is good.This recipe was easy to half and I used Lay's potato chips instead of bread crumbs. My boyfriend loves this one!! I add more tuna and peas. I also add more milk before serving and when reheating so it's creamier.